Traditional arts and crafts in the Maldives have evolved over the years and many islands have now forged their own successful cottage industries. Most ancient Maldivian wood carvings are a wonder to behold. 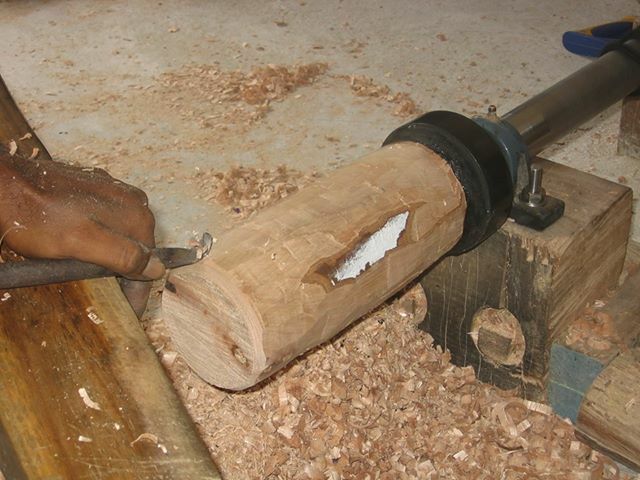 A Maldivian craftsman armed with a few rudimentary tools can carve smooth and finish master works in utmost dedication. The Dhoni, a boat which provides transportation to islanders is one of the best examples of Maldivian carpentry. It is carved with intricate designs. Many mosques too have intricate wood carvings. More recent times, however, have seen a concentration on smaller hand-made wood carvings such as vases, jewellery boxes and ornamental dhonis (traditional boats), which can easily be packaged as gifts for tourists. While these may be smaller in size, these carvings, supplemented by lacquer designs have as much, if not more, artistic value. Records show that the Chinese were the first to manufacture and trade lacquer, and in doing so, helped establish one of the Maldives’ most important art-forms. Lacquer work, or “laajehun” in local tongue, was bought to the Maldives in the 17th century and its protective properties against atmospheric change that made it so popular among Maldivian folk. Small wooden crafted containers and vases, and also buildings meant to stand the test of time, were decorated with lacquer painted intricate floral designs, in bold colours of red, blue, green and gold. However, recent times have brought into question the survival of this rich cultural heritage. This skill has always been preserved only in the island of Thulhaadhoo in Baa atoll but fewer artisans are taking up the craft. At one time lacquer works were a thriving industry and mostly the preserve of noble families in the country. Nowadays, the modern Maldivian craftsman has adopted ancient arts to create mass souvenirs true to Maldivian tradition, for gift shops throughout the capital of Male’ and in the resorts. 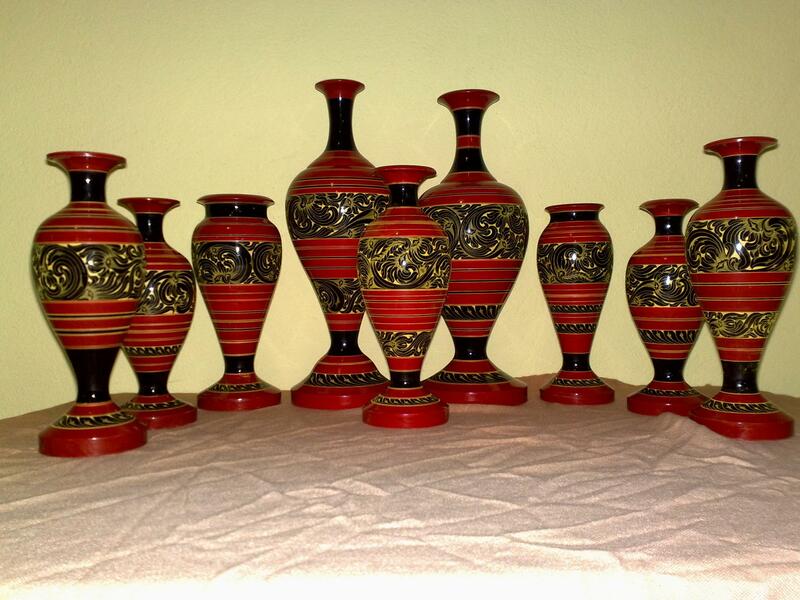 Maldivians use wood to make these containers and vases. In recent times some of the wood used is not ideal for being exported to drier and colder countries as some of the lacquered wooden handicrafts cracked once in Europe. Each one beautifully crafted and layered with a lacquer finish. The brightly coloured lacquered pots and vases that are made in this region can range in price from a USD10 for a small ornament to a foot high vase costing USD225! They come in all shapes, sizes and colours. Some are painted with a traditional Dhivehi design hand-drawn and known as “Liyelaajehun”. 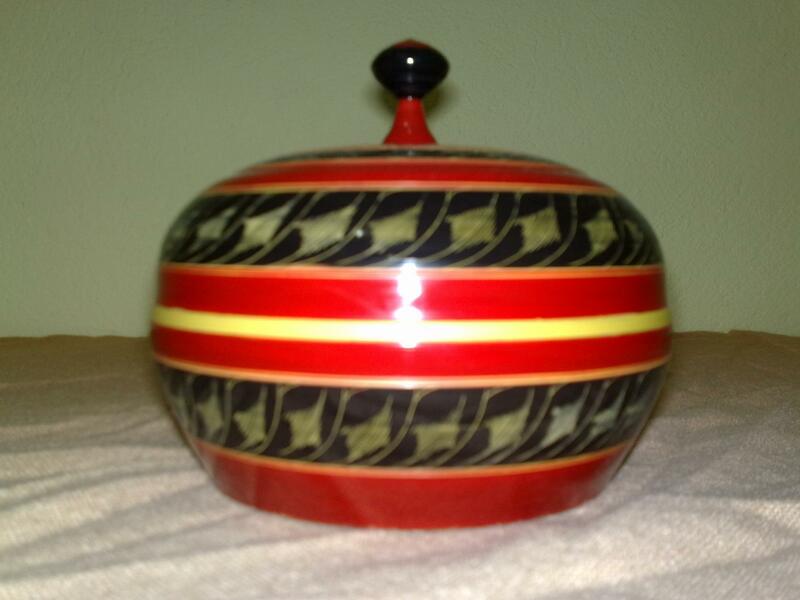 The colours used on the lacquer ware are very basic usually a very bright red, yellow and black and traditionally these were made from the juices from trees and insects in the early days. In the Maldives, lacquerworks are created according to tradition. Here is the process. First the materials, wood, lacquer and colours have to be sourced. The lacquer is softened with a hammer and filled with paint. Hammering it in turn heats up the varnish and enables the colours and lacquer to be mixed together. Then this lacquer is rolled out into a sausage shape and cut into small strips each around five inches. These later form the lacquer pieces which are soaked in water to soften them. 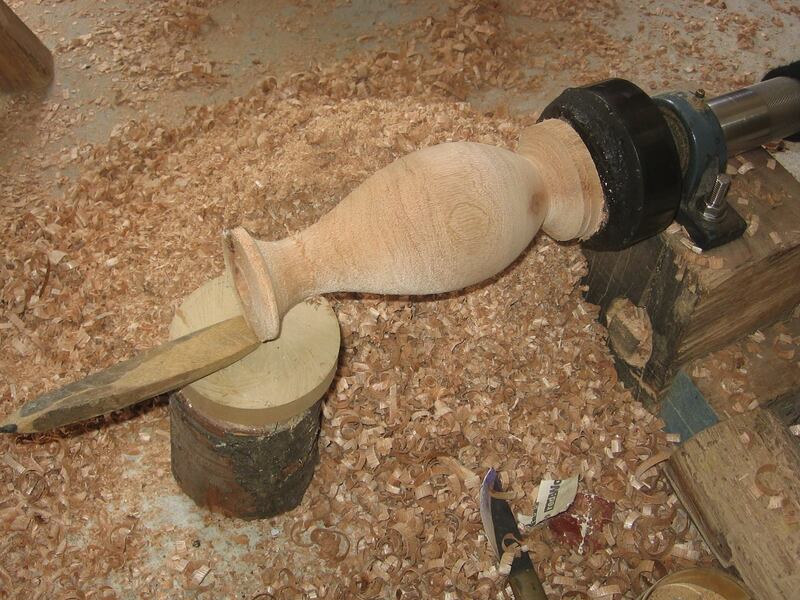 The next step is to shape a block of wood to make the base for the wooden ornament. This is done on a lathe and then the lacquer is applied and the piece polished off with a palm leaf. As Calcutta grew as a trade hub connecting east to the Middle East and Africa it became much easier to import these materials from India to the Maldives.From there, Burmese rice, the favourite staple of Maldivians, as well as the first Burmese lacquer ware, was imported into the Maldives. Now the colours can be bright pink, green, purple and orange. The lathe machine used to make the ornaments costs around $450 and is able to make around five ornaments which are then hand finished in lacquer. It can be a consuming process. After manufacture, they are then transported to the tourist shops in Male. These island arts however, are sadly dying out due in part to an oversaturated local market and increased competition from foreign souvenir companies that can make and import them at a fraction of this cost. One former lacquer artist Athif Amed, at one time widely regarded as one of the best in the country, has noticed that market has become saturated and he cannot make any money in the trade, and so he has returned to resort work and fishing. Athif worked and learned the trade for four-years in Thulaadhoo – an area famous for lacquer works. However, he decided to stop practicing this art because too many people had joined in the industry, making the profession unsustainable as the materials were too expensive and not readily available as they need to be imported from India and Sri Lanka. The actual handiworks are created on a machine and then painted by hand with bright colours or lacquer known as “laa” in Dhivehi. When the lacquer trade became saturated, Athif who is originally from Meedhoo in Raa atoll, returned home to work on nearby resort islands of Meedhupparu island resort and Rannaalhi as a part time accountant and fisherman. He hopes to return to it one day, if and when growing tourist trade in the islands make this cottage industry possible to thrive again once more. Mohamed Ali is also a professional lacquer artist who shares a very different experience. He took up the art last May to support his wife and child after returning to the island following 17 year career in tourism. Currently his lacquer works only earn his family around $350 per month by selling his handicraft to Male’ souvenir shops and a resort. However, he hopes to improve this earning capacity by opening a small three bed guest house shortly. Here, he is considering hosting lacquer workshops to enable people who would love to make their own lacquer works to do so and take them home. Some motifs used in the mosque ceilings and tomb stones are also lacquered but they are different from those used in lacquer work. For further research on these look to the works of Munch-Petersen, Nils Finn, The Maldives, History daily life and art-handicraft. Bulletin du CEMOCI, Centre d’Études du Moyen Orient et de la Communauté Islamique, Bruxelles 1982 as well a Ottovar, Annagrethe & Munch Petersen, Nils Finn. Maldiverne; Et Øsamfund I Det Indiske Ocean. Kunstindustriemuseet. Copenhagen 1980. Even more so than wood carving, coral carving brings to light the true depth of talent and creativity of the Maldivian craftsman of yesteryear – the intricate designs found on ancient burial stones and mosques stand as proof. Coral carving is also considered by many in the Maldives as a dying art form, but recent works by emerging young artists, using silicon blocks and other such materials instead of the endangered coral, indicates a revival. He is hoping that the introduction of the backpacker market to the islands will bring trade and boost his earnings. With the advent of backpacking there may be more interest locally in buying lacquerworks, he believes. Generally, the tricks of the trade are handed down through generations. His father and grandfather before him specialised in the tradition. 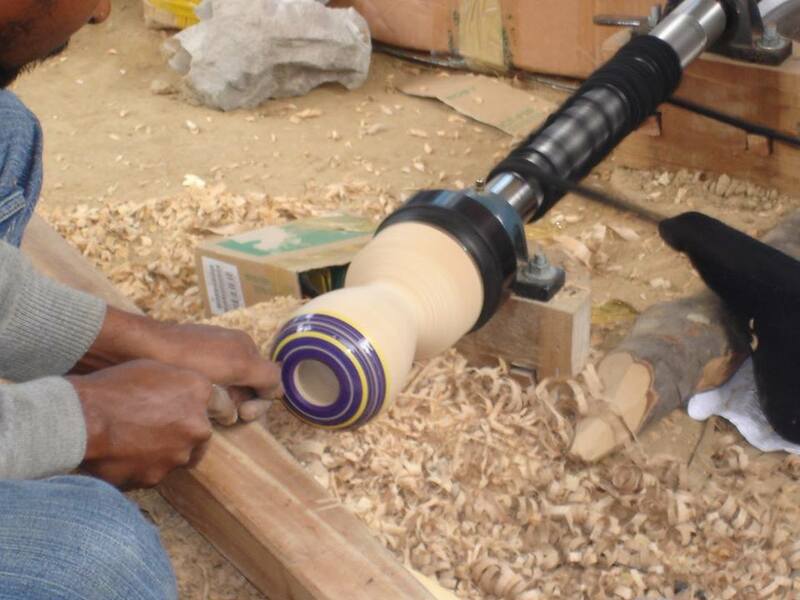 All in all, he estimates there are around 20 families specialising in this craft currently on the island. However, he also explained some of the challenges that the industry faces. “We don’t have enough resorts around our island to sell to, so we sell to Male’. Even more so than wood carving, stone carving brings to light the true depth of talent and creativity of the Maldivian craftsman of yesteryear – the intricate designs found on ancient burial stones and mosques stand as proof. Stone carving is considered by many in the Maldives as a dying art form, but recent works by emerging young artists, using silicon blocks and other such materials instead of the endangered coral, indicates a revival. Since there is no clay or ceramic industry native to the Maldives, due to the coral sand, Maldivians have become adept at working with coral and also lime stone as building materials. In fact many of the houses in the rural islands are made of coral. They have carved upon them intricate designs. Traditionally coral was used as the main canvas to work on. Coconut thatch too was once widely used in the building of the traditional Maldivian house. Fungi and panels of plaited palm fronds are traditionally used for fences, walls and for roofing – as I noticed on a visit to Meedhoo. In modern times this has been adapted to more ornamental uses such as decorating the exteriors and interiors of building. All in all, indigenous arts and crafts still have a place in the Maldives, but the Maldivians need to be motivated to save their own heritage from market forces in order to preserve it for future generations. This will help to keep their ancient practices alive with the power of the tourist purse to sustain it – perhaps the backpacking market will help greatly. The island is also famous for fishing and has a small population of 2,773 people with more than fifty per cent of them employed in the fishing industry and 10 per cent practicing lacquerworks. The remaining 20 per cent work in the resorts and tourism industry. There are three ways to reach the island, by speed boat, ferry – available three days a week Monday, Thursday and Saturday or sea plane. The ferry leaves at 9am from Male’ and reaches Thulaadhoo two hours and 30 minutes later, returning from Thulhaadhoo at 1pm. 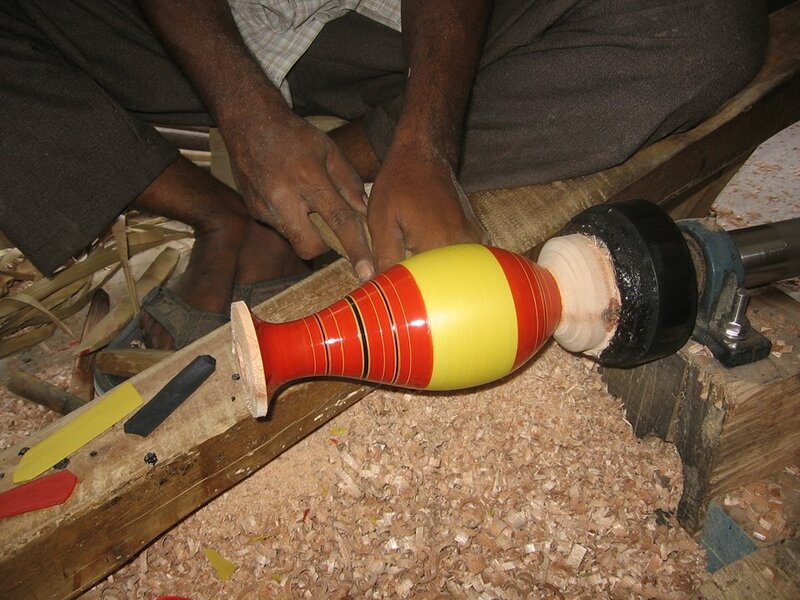 Nice Article about Maldivian Handicraft works. Baa Atoll Thulhaadhoo is an ideal place to visit. They have nearby Whale Shark point and Also Manta point. Also the Island is close to Protected UN Marine Biosphere in Maldives. At times of the year you would be able to spot Pilot Whales. Agree . This article was very helpful. It’s useful for me to use some of the info for my essay for school. thanks for this article.n proud being in that community. i love my Thulhaadhoo.